This is the mostbright systém of this type of ways in ČR. 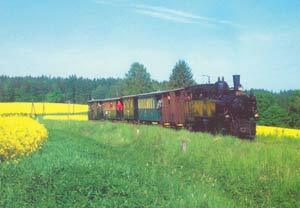 The track are from Obrataň to Jindřichův Hradec and to Nová Bystřice. You can see there motor trains and by special occasions you can see vapour lokomotives (the actions are Easter ride, Day of children in Střížovice and unlocking local trains). There is possible transport cycles.